In this compelling and compulsively readable memoir, nineteen-year-old Paige Rawl tells the story of how she was mercilessly bullied in middle school...and how she overcame the ordeal to change her world for the better. In this astonishing memoir, Paige tells a story that is both deeply personal and completely universal—one that will resonate deeply with the thousands of children and adults whose lives have been touched by bullying. Paige Rawl has been HIV positive since birth…but growing up, she never felt like her illness defined her. It never prevented her from entering beauty pageants or playing soccer or making the honor role. After coming back from the HCC FrenzyPresents event with a copy of Positive, I was so excited to pick it up. At the event, the publicists spoke about Positive and what it was about, and I just immediately wanted to get my hands on it and start reading it the first chance I get. Unlike all the other books I read in my life, Positive is non-fiction, a memoir. My first memoir ever, and it was such a great experience. Before anything, I want to thank Paige for bravely sharing her story with the world. I have learnt a lot from it, and I'm sure many others have learnt as well. 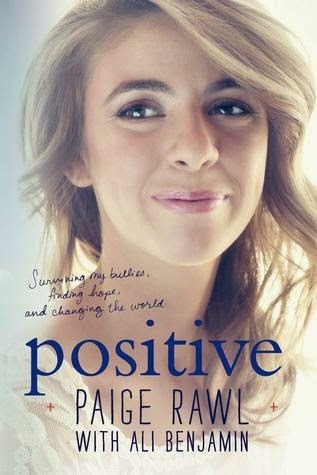 Since this is an autobiography, it is surely obvious that the whole book revolves around Paige and her struggles she faced throughout her life. Ever since she was born, Paige has been HIV positive. Please do not confuse HIV with AIDS! (That's one of the major things you'll learn from this book). Being HIV positive does not affect the way you walk or talk or in any recognizable way. Being HIV positive means that the infected person is more likely to get risks against viruses out there. Despite Paige looking and acting like any normal teen, the fact that she is HIV positive has really put her through a lot. (Oh, and it's not contagious either!). Reading this book, I went on a roller coaster of emotions. To be honest, I always thought autobiographies are boring to read, but I enjoyed this as much as I might have enjoyed any YA realistic fiction out there, although this one even more because it's ACTUALLY REAL! I think that being through a lot myself has made me love and connect to this book even more. Anyone who's ever felt alone, bullied, been through depression or any other mental disorder, or any of that stuff will definitely feel hope through this book. Paige acts as a voice for all those children and teenagers out there, who are still not brave enough to say something themselves. Paige has really turned her life into the better, and I feel so immensely proud of what she has done with all the experiences. I someday wish to inspire someone just as how she has truly inspired me. "I'm telling you: it was the most visibly broken assortment of human beings I'd ever been around. But I don't know. Maybe being broken helps you understand others' brokenness. Maybe being broken helps you become a better person." This is one of the few autobiographies I'm interested in. I don't care to read about the lives of celebrities, but this sounds like the type of story that will touch me. I don't think I've ever read a memoir but I'm so glad that you enjoyed your first one! Never read a memoir, thanks for sharing you thoughts with us!